Image Size: 48 X 28 in. "Luck of the Irish” reveals a place that is near and dear to Flohr's heart. Painted at the world famous Buena Vista café in San Francisco, the composition showcases Flohr’s incredible mastery as one of today’s most talented modern impressionists. Flohr first became familiar with the café during his years as an art student at the prestigious San Francisco Academy of Art. Something about the welcoming energy and history of the café captured his imagination. He would sit for hours sketching and talking with his favorite bartender, “Fred”. Fred has been a permanent fixture at the BV for over 30 years. Originally opened as a fishermen’s saloon back in 1916, the café has remained a beacon of hospitality ever since. Their world famous Irish coffee was first introduced in 1952. Legend has it that a challenge was put to Travel Writer Stanton Delaplane by the then-owner of the café, Jack Koeppler, to recreate the original Irish coffee served at the Shannon airport in Dublin. The two men “worked hard” through the night, finally succeeding by morning. Nearly one million libations later, the recipe is still enjoyed by visitors from all around the world! It seems that twentieth century fishermen, 1950’s travel writers, modern day tourists, and young artists all agree, the Buena Vista Café is a magical place! 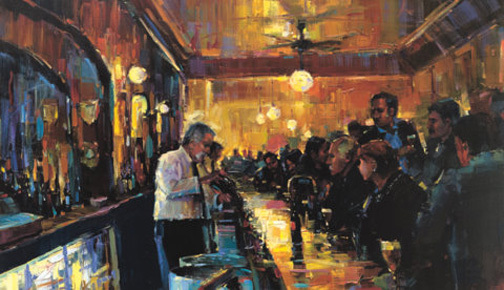 Flohr understands this better than most and has captured the unique essence of the café by concentrating on the bustling spirit of the bar and its keeper. His composition draws the eye towards Fred the bartender, who stands behind the polished old world wood of the famous counter. Glass bottles are illuminated in the soft glow of the light and patrons are gathered all around as Fred tells his jokes and spins his yarns for the eager listeners. Their friendship as well as Flohr’s genuine fondness for the café is evident in the golden coloring and textural details of this beautiful work of art. His brushstrokes work to tell the story, bringing to life the unique smells and the sound of chatter and laughter. With his confident handling of form and playful use of light, Flohr fills his painting with a strong sense of nostalgia while remaining true to his modern perspective.